One of the biggest myths about the great depression is that FDR's NEW Deal and the related government intervention and public works projects got us out of the Great Depression. 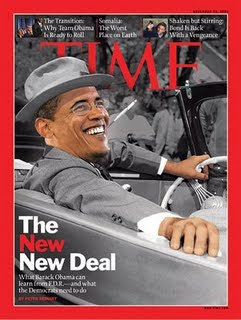 The truth is that the New Deal did not work. Instead of creating growth in the private sector, it created government growth that squeezed out the private sector. ...The study represents a challenge to the widely held view that Keynesian fiscal policies helped the US recover from the Depression which started in the early 1930s. The authors say: "[Franklin D Roosevelt's] interventionist policies and draconian tax increases delayed full economic recovery by several years by exacerbating a climate of pessimistic expectations that drove down private capital formation and household consumption to unprecedented lows." The prognosis is catastrophic if projected government policies are not cut back. According to the White House's own estimates, the federal budget deficit in 2009 will be $1.6 trillion, approximately 11.2pc of the overall economy, the highest on record since the end of the Second World War. In 2019, the national debt will represent 76.5pc of the US national economy, the highest proportion since just after the Second World War. In such circumstances, the international reserve status of the US dollar will not survive. As it fades, so interest rates on government securities will rise and the real burden of servicing the debt will increase. In such circumstances, the US economy will teeter on the edge of a black hole. Prosperity and full employment in the US will only be restored by a return to laissez-faire capitalism. Our study outlines a radical, but politically feasible, approach. Monetary policy should be expansionary. But, on the micro-economic side, tariffs and other trade barriers should be repealed unilaterally; a "Right-to-Work" Act should reduce the minimum wage and curtail the powers of unions; and business regulation should be reduced. Individual banks and their counterparties should not be bailed out, although the system should be protected by ensuring that failing banks are wound up in an orderly fashion – this is the only way to restore market discipline. They say that Adam Smith would not be optimistic with today's American economy, as long as the liberal wing of the Democratic Party is running the country, neither are the rest of us.